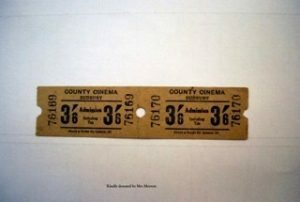 During the past 50 years or more the style of tickets for functions has changed. The design and use of tickets tells the story of the way people spent their leisure time, the cost of going out and the method of printing. 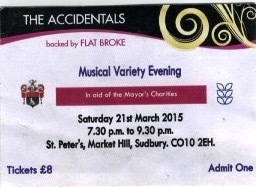 There were local community functions when the ticket was produced on a piece of card available in the organiser’s home and either handwritten or printed using a John Bull printing kit. Unfortunately not many of these tickets have survived and we do not have an example in the archive. As people began to have access to typewriters the ticket often got printed on a sheet of paper, this could easily be lost but was easier to mass produce and less messy than the John Bull printing kit. Cinemas and theatres had distinctive tickets, the former rather like a cloakroom ticket and the latter a professionally printed ticket with details of the production. 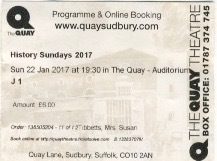 Today the cinema ticket may be bought on line and there is no hard copy produced because the telephone is shown with the email confirming the booking and the audience just take their seat in the cinema. Theatre tickets can be more elaborate and quite large but now because of the information taken when the booking is made it is possible to trace the seat should the ticket be lost. Airline and ferry tickets were once produced with complex legal wording on the ticket counterfoil, printed in such small font it needed a magnifying glass to even start to read and decipher. Now the booking is made on line and a normal sheet of paper produced to confirm the booking. At the port the passenger does not even have to show any proof of booking because the car registration is recognised as one drives through and by presenting the passport the booking is confirmed. There also tickets for concerts and invitations to suppers and other such social gatherings.